Rains overnight and constant drizzle at the start of the day meant there was a delayed start and as a result the game was reduced to a 17-over affair. And both teams were light going into the finals with Bharath and Shithu, batsman and bowler of the tournament respectively, for ACT and captain Kapil among others for IDM Crickters. Vinay pulled a six to get the innings off to a rousing start and the intention seemed to be to make the most of the powerplay overs. The rains meant the outfield was a little heavy and boundaries later would be difficult. In the process wickets also were sacrificed as both Sharath and VInay were both preys of their own hunting methods. Rishab, batting in at one-drop and a very aggressive Deepak got stuck in and continued to look positive and score the runs at the pace their captain asked of them. Deepak, in particular looked imperious as he batted with more freedom than usual even clobbering a six as he payed the role of setting the pace for the rest of the folks to capitalize on later. With Srikanth finishing his overs up top and the others looking less threatening than he, Deepak branched out to score runs on both sides of the wicket with equal fluency. Rishab played a great foil feeding him with strike as often as possible thou there was a phase where both kept hitting their boots with the bat hampering their running for a brief while! The pair added 74 for the third wicket in just under 10 overs to setup the last 4 overs of the innings to the power hitters in ACT to push the score closer to 150. Benjamin used his brute strength to good effect and Deepak hung around to push the score closer to 150. They ended with 141, which seemed a high total on still a heavy outfield. IDM Cricketers’ chase was rather bizarre as the wind ran out of the sails very quickly. A shortage of personnel meant they had to push their best batsman this tournament, Swayam, down the order and their lynchpin through this tournament – their opening stand – was changed for this game. Prasen though was up to the task of the opener as he went about his task of going after the ACT quickies with the ball new with good intent, Heavy outfield, big outfield and a lot of spinners in the ACT ranks meant IDM Cricketers had to make the running at the top. Prasen’s innings came to an end in the 4th over spin was already on show and Thomas scalping him. Swayam walked in and looked threatening. 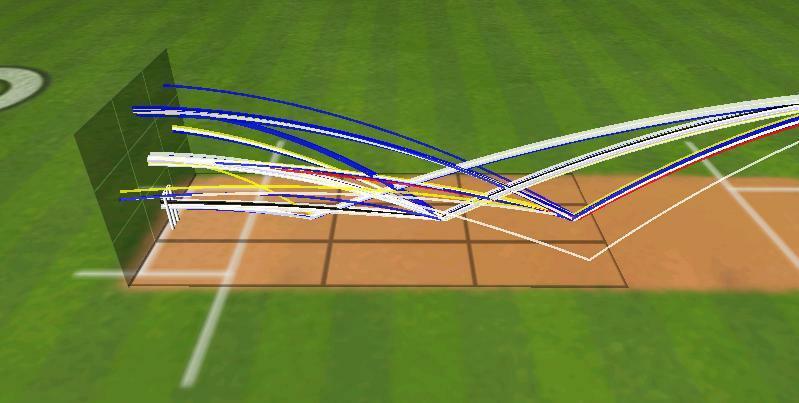 Unfortunately for him and his team, Melvin was struggling for timing and rhythm at the other end as he struggled to not just find boundaries, but increasingly difficult to even rotate strike as the spinners kept him pinned down. The pattern would be commonplace through the innings as Melvin neither found runs nor got out thereby increasing the pressure on his partner at the other end. Swayam fell prey to the pressure and ended up run out to the pressure. The runs were more and more difficult to get and no one walking in found runmaking easy as ACT stifled all IDM Cricketers batsmen. In the end, it was but a formality when ACT won the game rather easily by 5 runs. Barring a poor game right at the start, they have been the team of the tournament and a trifle unlucky not to be in the main finals. Brief scores: ACT 141/4 in 17 overs (Deepak 58 (46 b, 8X4, 1X6), Rishab 27 (29 b, 3X4), Srikanth 2/32) beat IDM Cricketers 90/7 in 17 overs (Melvin 28 (48 b, 1X4), Thomass 2/23) by 51 wickets. 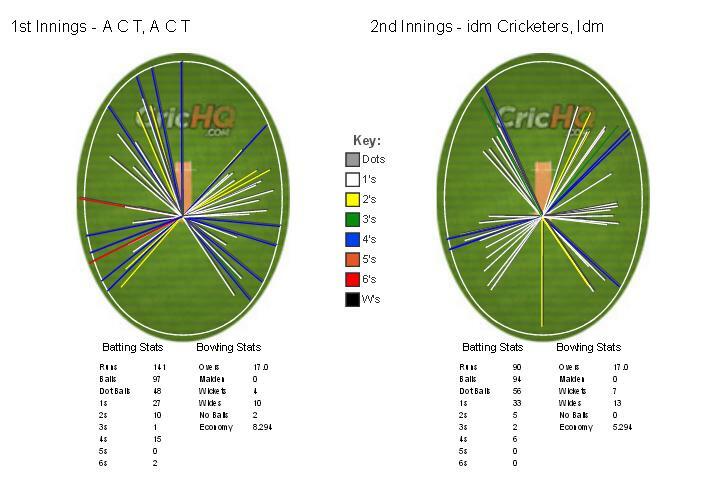 Full scorecard with individual performance chart can be downloaded from here. In what turned out to be a a low scoring thriller with a lot of needle between the sides, another poor batting display by THBS is what cost them in the end. Opting to bat first, THBS put Siddharth up the order in a bit to change things up a bit and it lasted all of one ball as Goutham sent him back for a first ball duck. The old and trusted pairing of Lalit and Arun were left to take on the new ball from the second ball on the innings. Arun continued his very fine tournament with the ball (also with the ball and also behind the wickets) by taking the new ball bowlers on. While he looked his confident fluent self, Lalit struggled against Goutham and Goutham soon sent him back for a duck as well. Goutham’s first spell would prove to be a decisive factor in this game as his miserly overs and two strikes at the top also accounted for captain Chandan and the other form batsman Shreyas too to leave THBS tottering. 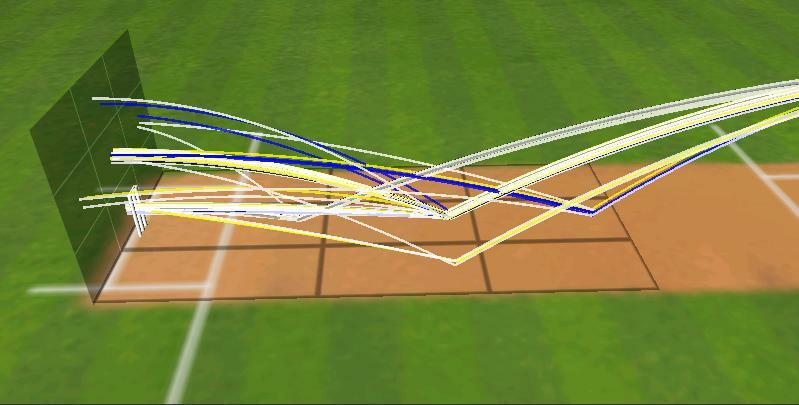 With Arun holding fort with Vishal for a bit, a recovery of sorts looked promising, but the dismissal of Arun in the 14th over, put paid to any of those hopes as Nikhil ran through the lower order and had THBS bowled out in the 18th ovr for a paltry 87. Chasing a modest total, Swayam and Nitin began cautiously looking to see off the threat of the new ball. The pair showed restraint in strokeplay and it worked in the sense of not losing wickets. Half way through, 44 for no loss seemed a perfect position to be in, but losing Nithin just past the half-way mark and Goutham to the next ball kept THBS’s spirits and hopes very much alive. Swayam, continued his impressive run with the bat with another fine knock as he held the innings together. But a bumper to his head shook him a bit and he soon was out with the victory still another 30-plus runs away. A lot of needling and verbal volleys were exchanged in this final leg of the innings, but captain Kapil and Asheesh held fort to bring up what would be a comfortable win in the end. Gokul took a tumbling catch at short midwicket to send back Aseem off Gaurav in the second over as Gaurav followed it up with the wicket of Praveen soon after. 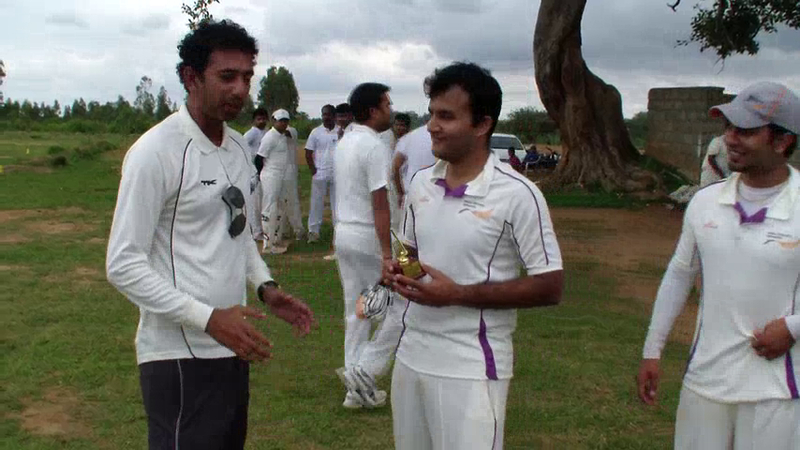 Botlz though fought back with Sachin and captain Sandeep, coming off a an injury. Sachin was a tad lucky as his aggressive streak streak also produced chances only for the CECC fielders to spill them repeatedly. Captain Sandeep was let off by his counterpart Goutham as well. Gokul though produced a fine spell as he sent back both Sachin and Sandeep in the same over to tilt the scales even once again. 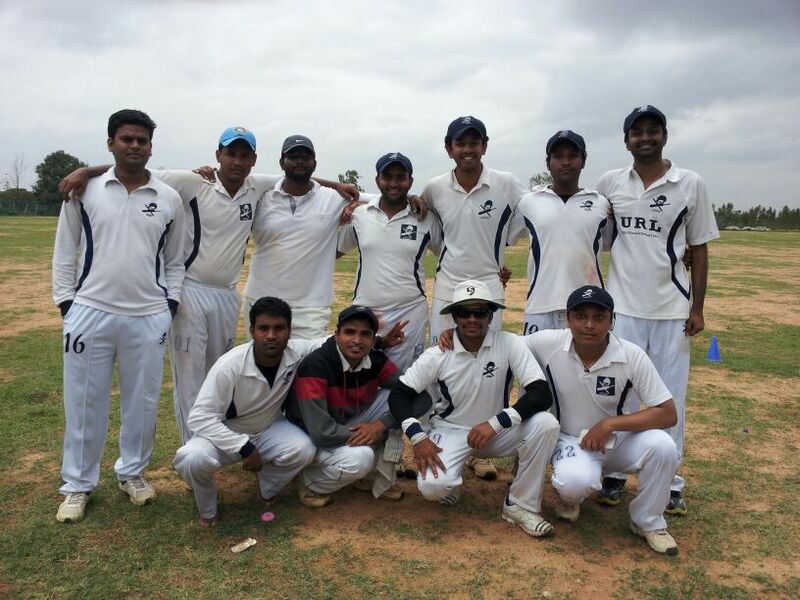 But Vikas and Nagaraj produced a brutal finish to the innings that produced 50-plus runs in the last 5 overs. The partnership had the fielders and bowlers scurrying as a the final kick pushed the score upwards of 140 and set CECC a stiff target. CECC’s hot-and-cold batting came back to bite them on the back as the top order stuttered against Nagaraj who followed up his hard hitting innings with a wonderful spell with the new ball. Goutham was sent back in the first over and Shoukath was run out not long after as CECC struggled to shake off the slow start. Harsha continued to fight in a promising partnership with Jobin as both found their feet as spinners came along. Things went astray when Harsha hit a long hop straight down the deep mid-wicket’s throat. Gokul and Gautam came and went as Jobin was left to wage a lone battle. When has was run out for 31, the pressure of the chase proved too much as Boltz coasted to a comfortable win in the end. Brief scores: Boltz 143/6 in 20 overs (Nagaraj 35 not out (19b, 3X6), Sachin 32 (32b, 3X4), Gokul LN 2/26, Gaurav 2/30) beat CECC 118 allout in 19.4 overs (Jobin 31 (31b, 4X4), Harsha 24 (23b, 4X4), Naveen 2/6, Sachin 2/24, Avinash 2/26) by 25 runs. ACT won the toss and elected to bat in this crucial league game for them. A win for them would force NSN to win their last match to qualify as group toppers to play the tournament finals. A lot at state for ACT going into the game. For Unisys though, Boltz’s victory over CECC meant they would qualify for as the 4th team from their group irrespective of the result. A rather sedate Vinay was the first to leave after a mix-up with his opening partner and captain Sharath. 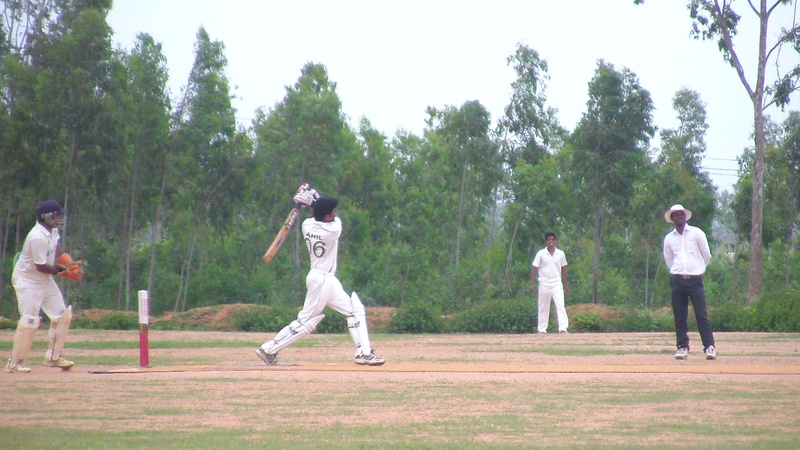 Their best batsman and also the tournament’s best, Bharath walked in and looked to dominate from the word go. A steady partnership developed between the two and Bharath looked good to continue his outstanding run in the tournament when Sanjeev struck him. Soon Sharath and Deepak joined him in the hut as Unisys applied the squeeze on run scoring through Mallikarjun and the others picked wickets around him as a result. Then, a crucial innings by Ajay in a good partnership with Bavesh pushed ACT above 110 which looked highly unlikely. But for the switch-hit that eventually proved his demise, Ajay looked in prime touch as he tackled all bowlers with aplomb. And a total of 114 was a fighting total given how well ACT’s bowlers were bowling through this tournament. Chasing under 6 an over seemed to bring a relaxed approach by Unisys as their top order approached the target with great confidence though Bharath was out in the powerplay overs. Harish looked in prime touch and Sandeep looking solid, the team 50 was raised under 8 overs and the chase looked on course for an easy coast to victory. 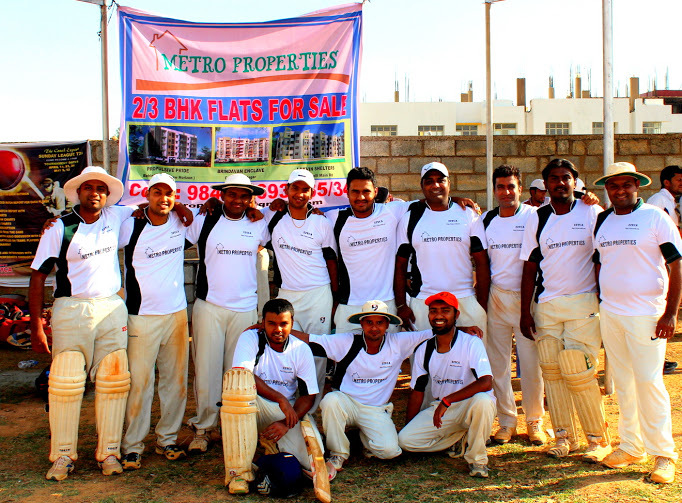 Rakesh though broke through with tremendous big hitting to keep Unisys in the hunt. His entertaining and enterprising 30 thought still was not enough as ACT held their nerve as Bavesh produced an outstanding last over to land his team a close but satisfying 6 run win that provisionally put ACT on top of Group B. Brief scores: ACT 114/9 in 20 overs (Ajay 29 (24b, 4X6), Bavesh 24 (26b, 1X4), Kaushik 3/25, Prahshanth M 2/22) beat Unisys 106/8 in 20 overs (Rakesh 30 not out (28b, 2X4, 1X6), Thomas 2/19, Shithu 2/19) by 8 runs. The video is inverted, it can be viewed here. ACT winning their last game meant the pressure was on the group leaders NSN to win their last league game to remain on top to qualify for the main finals of the tournament. And they looked up for the fight from the word go. A brilliant run out by Satya in the first over sent back Chirag and NSN had already established a vice-like hold on the game from the first over. NSN didn’t let the opportunity go to try out a different bowling combination as Vidyasagar opened the bowling and held back Lalmani for a different role. As the batting innings wore on and only Ramesh seemingly having the bearings to counter the challenges offered by the spin and medium pace combination of NSN bowlers. 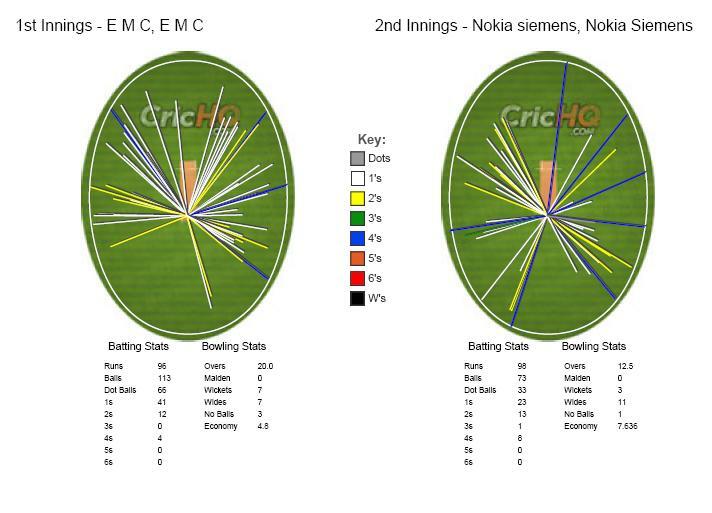 Almost all NSN bowlers got a go as EMC never threatened to take the attack to the bowling allowing NSN to rotate bowlers and experiment at will. With Ramesh getting out in the 15th over, it was as best as EMC could do to stutter close to 100 at the end of their innings as Saravanan and an injured Krishna found some runs at the end. NSN stuck to their mantra of opening with their regulars – Prakhar and Avinash – and the pair produced another good start as runs came in torrents in the early overs as EMC bowling struggled for consistency. Both openers rarely looked in trouble and looked good to finish the game by themselves as they raced to 50 in the powerplay overs. Jeethendra though provided his team the much needed relief as he sent back both openers soon after powerplay. NSN chose to send their players that hadn’t had much of a hit so far in the series a go. Ankit took the chance well as his high back-lift and flourishing follow through left-handed batting lit up a dull game with some sparkling strokeplay at the end. 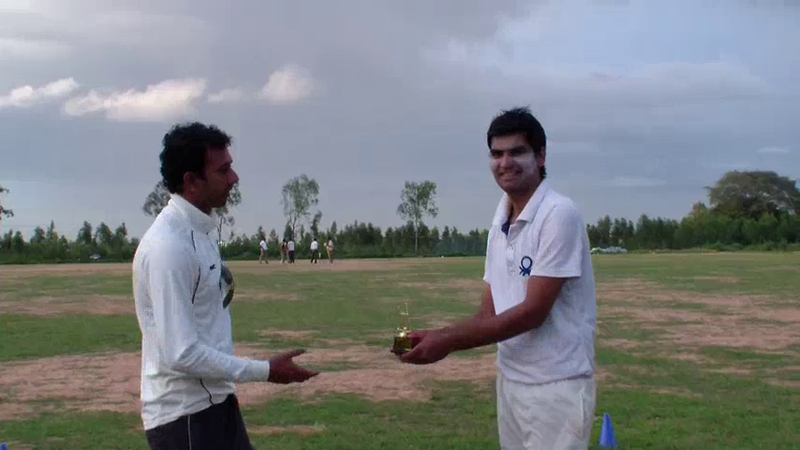 His off-shin was sharp in the game and with him finding runs at the end, he was the Player of the Match. Brief scores: EMC 96/2 in 20 overs (Ramesh 35 (54b, 2X4), Saravanan 21 not out (20b, 1X4), Ankit 2/23) lost to NSN 98/3 in 12.5 overs (Avinash 35(31b, 2X4), Prakhar 27(22b, 2X4), Jeethendra 3/32) by 8 wickets. GE won the toss in a game they had very little pressure. Their net run rate was very high that even a loss guaranteed them a place in the finals. 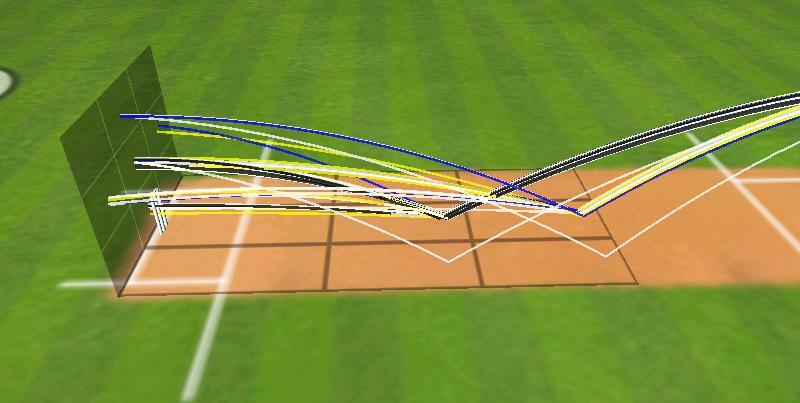 Like NSN, they chose to experiment a bit with the batting and bowling combinations a bit. For starters, captain Abhishek pushed himself up the order and produced a chancy by stroke filled 79. His partner and one of the shining lights of the tournament Rajnikanth skied a lofted drive to be out for a low score in this game. Amit and Dheeraj batted up the order even as Abhishek was making the most of the many spilled chances Wowzers were guilty of giving him. Amit and Dheeraj had short stays, but Harsha stuck around for a bit to be involved in a 56 run partnership with Abhishek in under 5 overs. Abhishek looked good to get to a hundred when he was out in the 15th over for 79. The scoring rate dipped at the fall of his wicket but a decent finish by Bhaskar ensured the work of Abhishek was not wasted as GE ended with 174. Chasing a steep target, Muzaffer slammed the first ball he faced from Dheeraj over mid on for a massive six. Dheeraj struck immediately trapping Muzaffer in front the next ball. Suresh and Ravi looked good and as has been their bane through the tournament, converting starts to meaningful scores let Wowzers down again. Ravi and Karthik looked to be in good flow as GE moved to rotating their fringe bowlers after the burst from regulars Dheeraj and Abhhisek Pathak. Vivek, Dyaneshwar and Ankit all got their chance to roll their arm over as Wowzers’s innings took a nose dive following the wickets of Karthik and Ravi. Vinoth bowled his offspin well to pick up 2/22 in the absence of regular frontline spinners Arvind and Mallikarjun. Captain Abhishek rounded off an impressive league phase for his team by bowling himself and picking up the last wicket to give his team a massive win. Brief scores: GE 174/9 in 20 overs (Abhishek 79 (54b, 7X4, 2X6), Harsha 20 (16b, 2X4), Rajesh 3/33, Karthik 2/25, Rakesh 2/31) beat Wowzers 120 all out in 19.4 overs (Ravi 30 (38b, 3X4), Karthik 15 (12b,2X4), Vivek 2/3, Vinoth 2/22) by 54 runs. Unisys seemed to have brushed off the blues of their last two games as they seemed positive as they came out to bat against IDM Cricketers. The openers seemed to be in a hurry and the first five overs yielded 54 runs as IDM Cricketers found it difficult to stem the flow of runs. 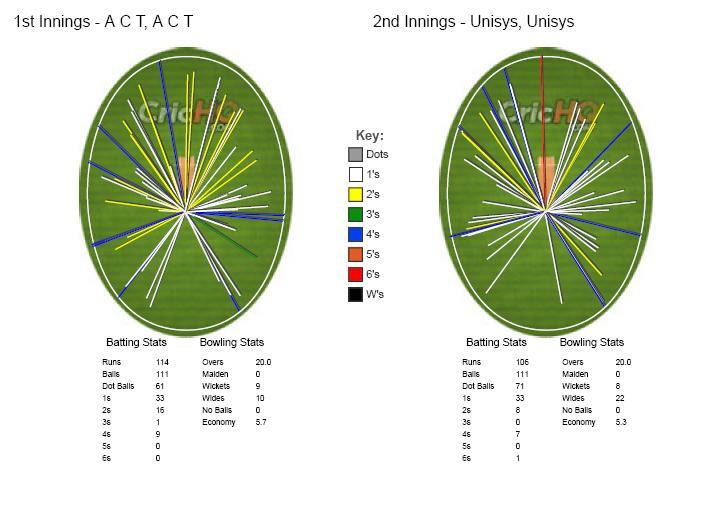 As is the wont with Unisys batsmen through the series, none of their batsmen were able to convert their starts into big runs as IDM Cricketers clawed their way back into the game through Ajit who ran through the Unisys middle order to finish with 4 for 13 in his 4 overs. 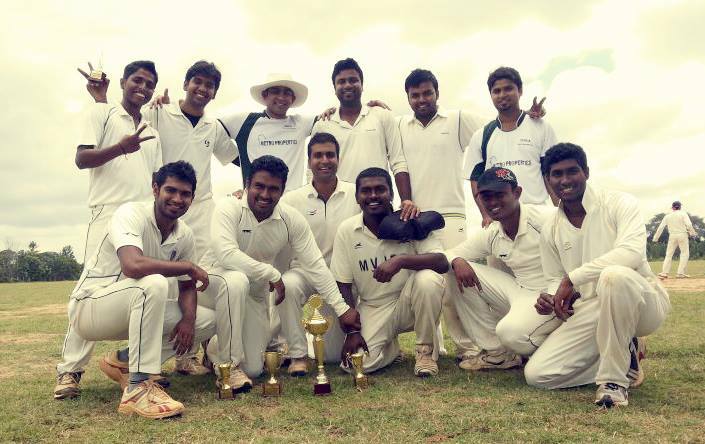 IDM Cricketers started in a similar vein to Unisys as their openers found form for second straight game in a row. Sudhanshu was at his punishing best again as he tore into Unisys bowling while Swayam played the anchor at the other end. Sudhanshu’s 28 consisted of 5 boundaries and Swayam stayed solid as they raced at 9 an over for 10 overs. Swayam held fort even as he lost Sudhanshu and Melvin in a short span of time. He stayed unbeaten for second straight game in a row as he brought up his second straight half-century for the tournament. He remained unbeaten on 63 as IDM Cricketers brought up the win in the 18th over. Full scorecard is unavailable for this game. It was a day where just about everything (barring a freak accident to Thomas who stepped on a ball hurt his ankle) went right for ACT. All their batsmen found form and managed to get quick runs. All their bowlers were spot on. 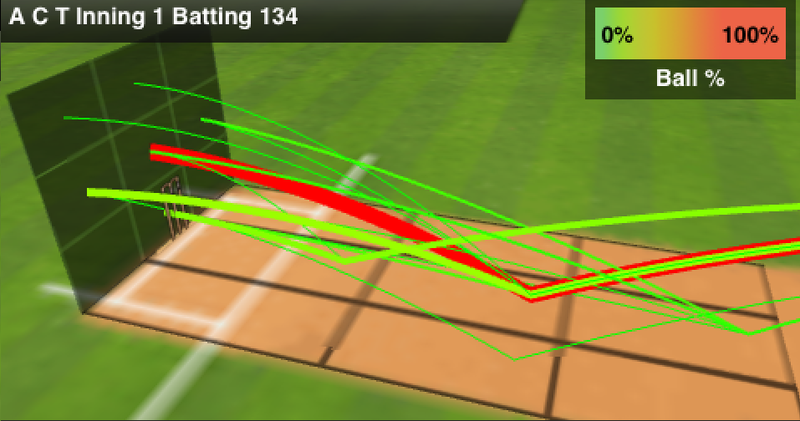 When they hit the ball in the air, often the fielders overran the ball or simply dropped them. Vinay and Sharath opened the batting and looked to be positive from the onset. Vinay was the aggressive of the two and also the chancier of the two. 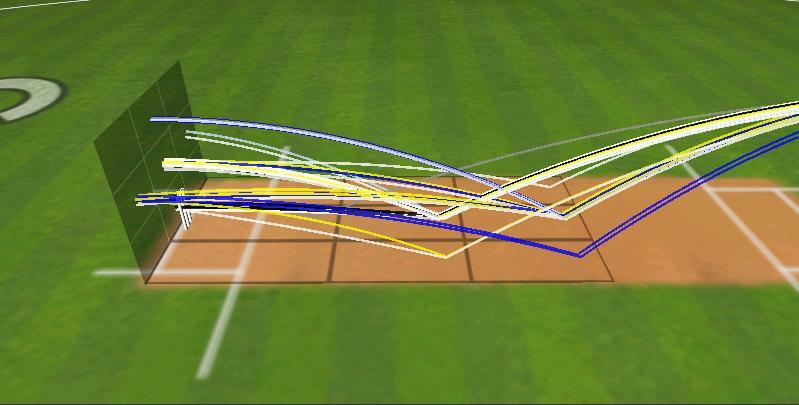 Often looking to go over the top, he quickly spread the field around with some clean hitting. 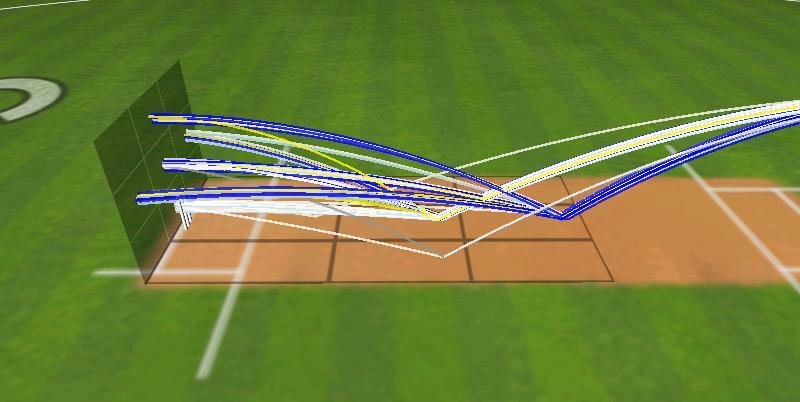 He maneuvered the field brilliantly often by stepping out and hitting over the top and then waiting for the short ball and then putting them away. 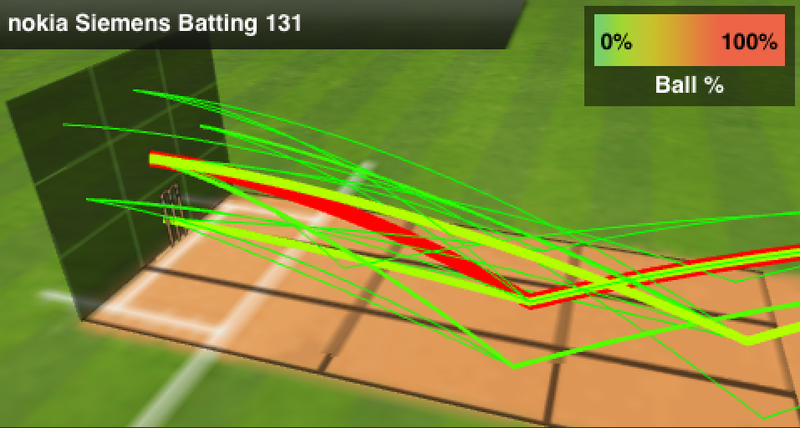 He pushed the mid-on wide with his flicks and then would charge down the wicket to hit over straight-mid on. He seemed to be two steps ahead of the bowler and fielding captain all the while. He was also lucky as he did give more than a chance to the long-on fielder only for him to badly misjudge the first one and then drop the next one. Sharath on the other hand was keen to put Vinay back on strike as often as possible in the powerplay overs. He played pleasing drives and cuts himself but seemed content to anchor the innings. He would often take the odd calculated risk, but seemed to be working to a plan as runs flew in a torrent as the openers put on over 100 in the first 10 overs. Vinay finally ran out of lives in the 12th over when he holed out. But he had produced an outstanding innings to give his team a massive start. Bharath joined Sharath, who by now was well set to take over the mantle of quick scoring from Vinay. Sharath and Bharath produced outstanding flicks to the legside in contrasting styles – Sharath all along the ground and Bharath often managing one-bounce hits to the fence. Sharath fell 2 short of his half-century, but Bharath was keen to push his team to a total closer to 200. 60 were added in the last 5 overs between Bharath and Deepak as ACT fell 11 short of 200. Chasing 190 was going to be difficult against a good all-round bowling side like ACT and Wowzers understood the magnitude of that difficulty when Laxman was hit on the helmet grill by Benjamin in the second over. The batsman was run out as he wandered off the crease after being hit. ACT withdrew the appeal and let Laxman play. Both Bhavesh and Benjamin troubled the Wowzers’ openers and kept them honest with their pace and bounce. Bhavesh accounted for Laxman with a full swinging delivery. Captain Ravi walked in and seemed to be in good nick as he started finding the boundaries from the start. His back-cut off the bowling of Benjamin being the highlight. With Suresh seemingly getting into the innings and looking solid at the other end, the prospect of an entertaining chase loomed. It all changed when Benjamin was replaced by Shitender. Bowling quickish leg-breaks and often darting straight quicker balls, he troubled the batsmen. He produced a hat-trick in the 8th over of the innings that killed the chase. His second ball of the over was a quick full toss down the legside which Ravi top-edged to give Paddy a swirling catch at short fine-leg. He had Suresh playing back to a quick ball that trapped him in front as the batsman went to hit it across the line and got hit on the back leg. He produced another quicker ball that hit the next batsman right in front of the middle-stump to bring up his hat-trick – and also the first at this ground. Nani and Prithvi played out some pretty strokes in another attractive mini-partnership of 31 for the 5th wicket before Ajay broke through with two wickets in two balls. Shitender came back to pick 2 more wickets with the last two balls of his spell to finish with 5 for 13 for the game that set up a massive 100-run win for ACT. 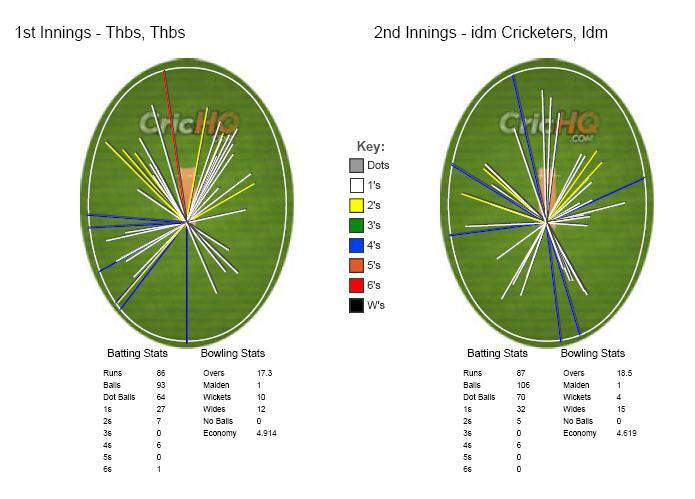 In a game that was under constant threat from the rains, THBS opted to bowl first perhaps thinking it best to chase in case the game was shortened because of the rain as historically it tends to favour the teams chasing under the Duckworth/Lewis method. THBS captain Arun managed to get good nip off the surface and troubled both the NSN openers in his first over. But soon Avinash got the hang of the THBS bowlers and started to get inside the line and tuck the ball fine for boundaries. His partner Prakhar was solid at the other end and often pushed Avinash into taking the extra run everytime the ball went to the outfield. The openers opened up more as the first change bowlers Vaibhav and Dheeraj took a while to get their lines right. NSN seemed to be on the way to a massive total when they reached 74 for 1 at the end of 10 overs with Avinash well set for a big score. His dismissal soon after slowed the runs down and THBS clawed their way back into the match with some tight bowling. Stand-in captain for the day Satya walked in and ensured that there was no more damage whilst accumulating runs with dabs and flicks to the outfield. He held an end up as Deb and Anil perished at the other end in the quest for quick runs as THBS bowlers found their radar. Even with Manish looking threatening to take the game away with his clean strikes, THBS bowled brilliantly to not concede more than a single boundary in the last 5 overs of the innings. Chasing 134, THBS started off aggressively with Lalith in particular looking to take the attack to the bowlers. Manish for NSN had a mixed-bad bowling some very neat out swingers interspersed with boundary balls and Lalith cashed in. Lal provided the vital breakthrough for NSN when he sent back Lalith in the 5th over. Vishal’s fun out soon after powerplay meant the game was in the balance at 35 for 2. Chandan and Shreyas played steadily to build a base for the final onslaught as they cut out risks and looked to rotate the strike. With 80 needed off the last 10 overs with 8 wickets in hand, they seemed to have played themselves into a good position to launch an attack. A very impressive Rakesh and an equally impressive Satya standing up to his medium pace soon accounted for both of them to push THBS back. Soon, it followed a similar pattern to NSN’s batting innings that struggled in the 2nd half of its batting innings with boundaries hard to come by. There were a few needless overthrows, but by and large, Satya and his team had a firm grip on the game by now and they eventually squeezed THBS batsmen of any momentum by drying out any boundaries at all. By the end the target was 16 too many for THBS. Boltz were coming off a good win last week while EMC were coming off a bad loss. Boltz won the toss and elected to bat. 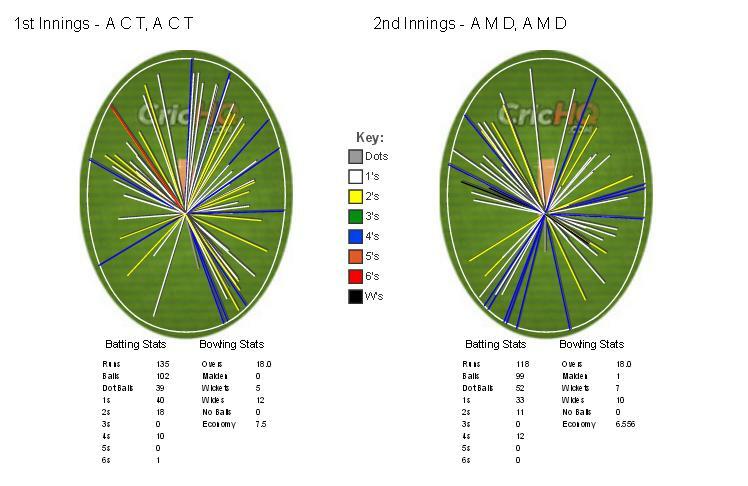 EMC started off slightly better than they did with the ball last week as Ramesh gave them some stability with his medium-pace. Robin, on the other hand had an erratic day with the ball as Boltz’s openers Sachin and Aseem helped themselves to easy boundaries on both sides of the wicket. Sachin, other than the one ball that nipped back and hit him in the midriff seemed at ease punishing the EMC bowling. He perished slicing a drive to Fredrick at long off. Captain Sandeep walked in and seemed edgy for the first few balls, but soon found his touch to be his fluent self again. Aseem on the other hand seemed to be enjoying himself as he repeatedly walked inside the line of the ball and punishing the ball to many legside boundaries. He was instrumental in keeping the runrate up and around 9 throughout his stay and looked good for many more than the 57 he made when he was runout. Vikas had a lucky break to be dropped early at long on and he made the most of it by plundering runs all round the wicket as EMC bowling wilted under his onslaught. The fielders seemed to be distracted with the right-left combination at the crease and the bowlers’ lines also suffered as a result. Vikas’s whirlwind 49 propelled Boltz to a massive 192 at the end of 20 overs. Chasing a massive target, EMC’s captain Sreekrishna pushed himself up the order and seemed determined to go after Boltz’s bowling. Aniket and Vikas provided a steady start to Boltz without looking particularly threatening. Fredrick was the first to go in the 5th over of the innings. 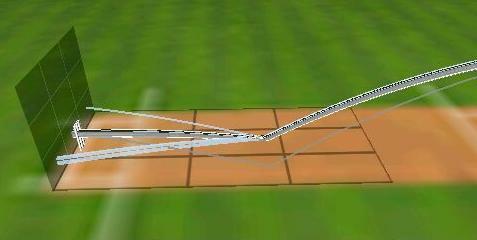 But a very wayward Abishek struggled to get his line right and bowled and over with many wides. Sreekrishna, in the interim had played pleasing strokes to push the fielders back and looked set for a pretty good score when he top-edged a delivery from Abishek. The bowler dropped the straight-forward catch but ran Sreekrishna out as both batsmen found themselves in the middle of the pitch expecting the bowler to take the catch. 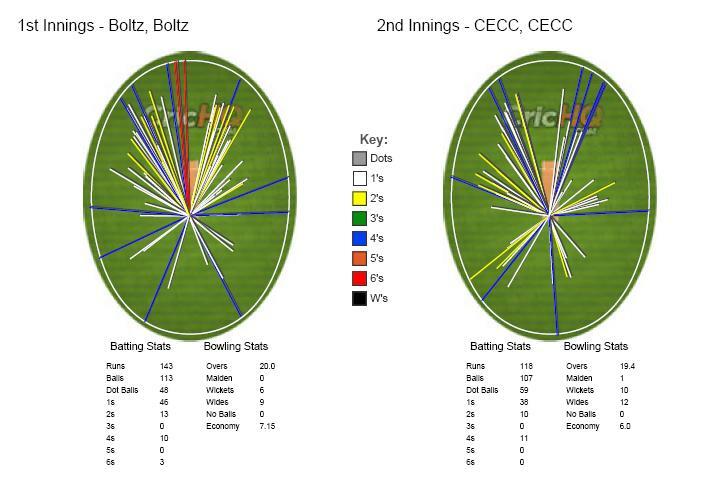 Boltz’s bowlers struggled for control as they conceded wides with constant regularity (a total of 30 wides in just over 17 overs), but the pressure of a huge chase ensured they kept chipping away at the wickets. Jeethu and Kushal had the wits about them to make the most of a very wayward Boltz attack as they strung together 41 runs for the 6th wicket in just a little over 4 overs. EMC’s innings folded up soon after as the lost the last 5 wickets for 8 runs to be bowled out for 133 in the 18th over. The game started under gloomy skies, the occasional odd drizzle and lazy soothing breeze best suited for a lazy weekend extended morning sleep. Yet, ACT openers Prashanth and Vinay started brightly punishing a slightly errant NSN opening spell by both Manish and Nitin. Prashanth, coming back from a shoulder injury shrugged off the indifferent form he showed in The CouchExpert Sunday League T20 two months ago and got into his stride with confident feet movement and strokes. If anything he seemed hesitant finishing his strokes showing signs that the shoulder injury was still preying in his mind. The pair kept rotating the strike thereby ensuring that they were really under no pressure for any length of time to attempt a rash stroke. Runs flowed and by the time Vinay got out in the 10th over, the runs were flowing at 8 an over. Deepak joined Prashanth and the pair stuck to the formula of keeping the dot balls to a minimum. Deepak ensured that Prashanth got as much of the strike and Prashanth gradually opened up to up the scoring rate post the 12th over. Prashanth showed tremendous fitness as he pushed Deepak into taking many 2s and 3s well into the innings. Prashanth’s 57 set the platform up for ACT to get to 170-plus, but a late stutter meant they had to settle for a score of 152. 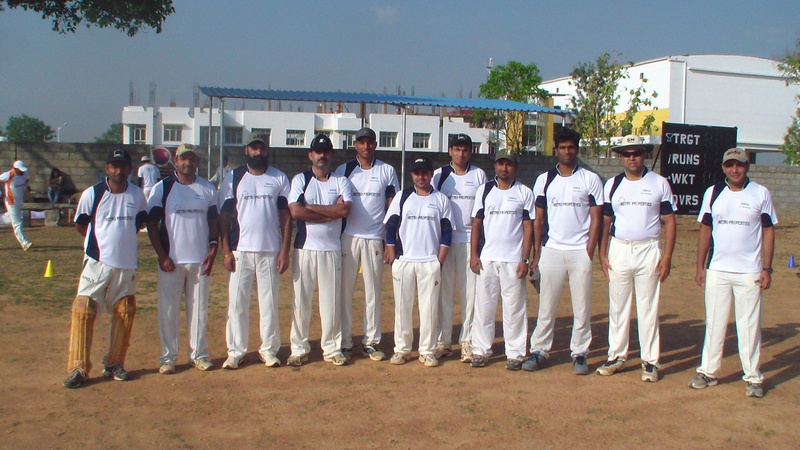 As for NSN, barring captain Gangadhar, the rest struggled to bowl to their field or to a set plan. NSN responded to chasing 153 quite brilliantly as openers Avinash and Jithendra started quite confidently against the pace-spin combo of Paddy and Thomas. The pair was measured in its approach keeping the risks to a minimum whilst always keeping abreast with the required rate. Only the extra pace of Rakesh seemed to hurry them up in an otherwise easily constructed opening wicket partnership of 61 in slightly over 8 overs. ACT, over time, have relied on their many slow bowlers to restrict opposition batsmen and quite successfully too. The spin combination of Shithu and Rohit slowed down the innings with Shithu accounting for Jithendra and Arun while Rohit accounted for Prakhar. And when the captain Gangadhar was run out in the 14th over, the asking rate had crept up to 8.3. Anil, then, played a cameo taking ACT’s captain for 17 runs in the 15th over to reduce the chase to slightly over run-a-ball. In the span of an over Anil had turned the game on its head and Sharath was left to rue his decision to bowl a second over. Sharath quickly turned to his quickest bowler Rakesh and he responded by knocking over the very dangerous Anil to even things out. With 25 still needed and Rakesh still breathing fire and NSN already 6-down, ACT still had a chance. As it turned out, 10 were needed off the last over with 2 wickets in hand for NSN bowled by Paddy. In a remarkably eventful over, Deepak dropped a catch at covers that cost his team 2 runs and Paddy missed to collect a throw from the boundary to effect a run-out as well. With 3 needed off the last ball, Paddy bowled a wide down the legside. 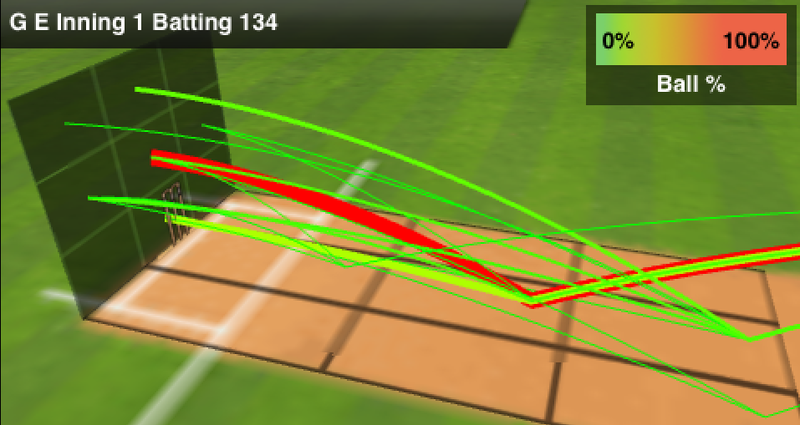 The batsmen then scrambled a 2 to long-off to round-off a remarkable win for NSN off the last ball. GE won the toss and elected to bat under skies that was bright for the first time in the day as daylight broke through the clouds seemingly vanishing the gloom with it. Having won The CouchExpert T30 Quadrangular only a fortnight earlier, GE started the game and the tournament as one of the title contenders. The opening pair of Shimjith and Rajnikanth that had served them so well in the previous tournament were in their elements as they went after Unisys’s new ball pairing of Prashanth and captain Harish from the word go. They rattled along at a rate of 10 an over in the first 4 overs before Rajnikanth was snapped up by Sanjeev off Murthy. Abhishek joined Shimjith and the pair looked to keep the score rattling along. In the quest of scoring quick runs, GE lost quick wickets as Unisys clawed their way back with back-to-back wickets of Shimjith, Abhishek, Dheeraj and Mayank in a span of 4 overs. It required the calm and reliable hand of Arvind in partnership with Harsha to steady the ship as GE ground out runs with singles and twos and the odd boundary. 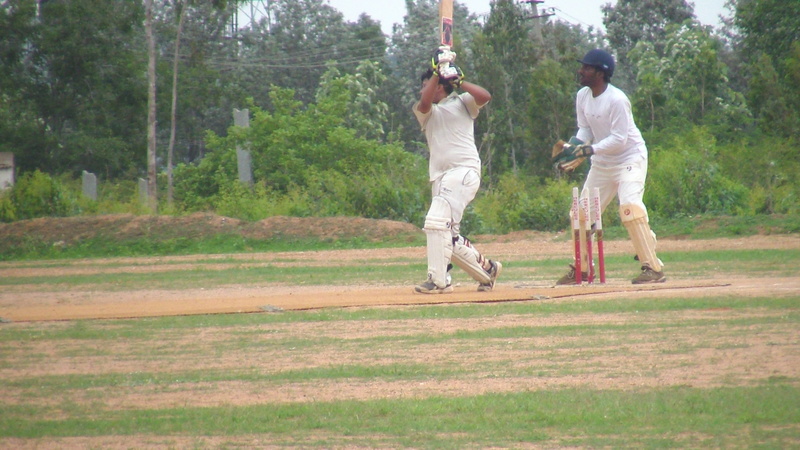 Arvind opened out towards the end to play punishing strokes on the leg side as he took GE past 150. Unisys had a horror of a start losing Sharath and Vivek in the very first over to Dheeraj. The GE bowlers Dheeraj and Abhishek kept the lid tight as Unisys struggled to score any runs at all. Almost every mistake of theirs was punished by GE with their wickets. Even slacking slightly between the wickets cost them their wicket as Harish found out while going for a single in the 4th over. 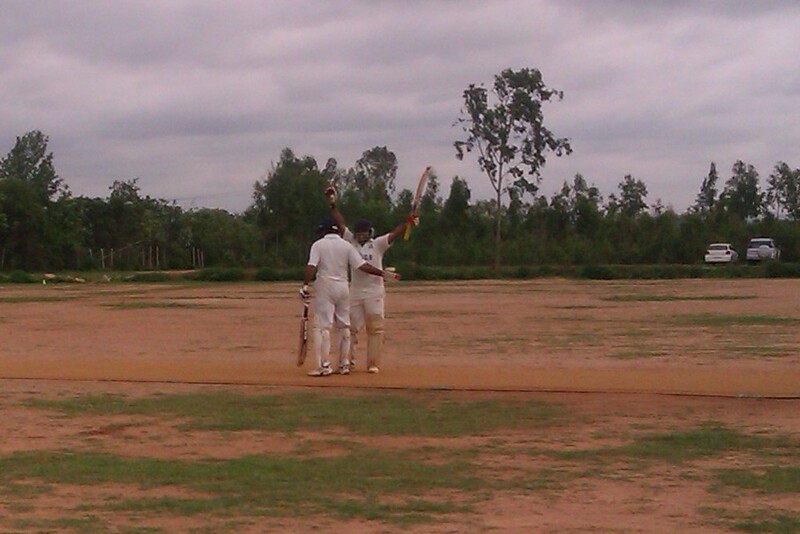 Sanjeev and Bharath then went about repairing the innings with a careful partnership. With the run-worm hardly getting off the floor, GE were firmly in control of the game by now, it was a case of minimizing the margin of defeat for Unisys. Gradually Sanjeev and Bharath found their touch and eventually the odd boundary as well once the opening bowlers gave way to slow bowlers. The pair managed to put on 58 runs for the 4th wicket in just under 10 overs before Sanjeev fell victim to another run out by Vinoth. CECC started the game without its captain and vice-captain as they were unavailable. After spraying his first handful of deliveries on either side of the pitch, Wowzers’s new ball bowler managed to land one on target that found the stand-in captain Goutham’s top edge to give Wowzers a tremendous start. The pair brought up the team 50 in 5 overs and when Shoukath deposited one of his booming drives over the long-off boundary CECC seemed to be running away with the game very early. Things turned around when another screaming drive of Shoukath seemed heading to the boundary when Wowzers’s captain Ravi intervened to take a very sharp catch at covers. It cut open the skin on his thumb and had him tend to it and sit out for a bit, but there was little doubt that he had produced the magic his team needed in bringing his team back into the game. 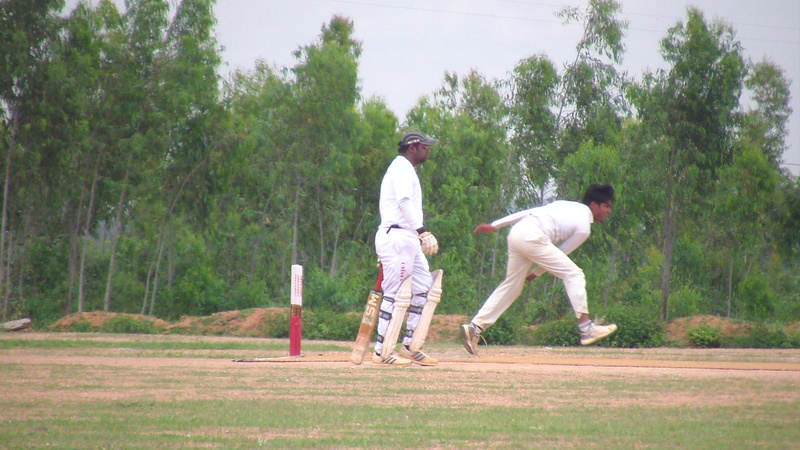 The introduction of Karthik further dented CECC as he sent back Gokul and Bhargav off successive deliveries. Gautam joined Jobin and the pair resorted to milking the bowling while riding troubled waters. Just as Jobin seemed to be branching out into playing pleasing drives a break in concentration accounted for him. Gautam, then joined by his twin Gaurav, kept maneuvering the fielding with drives and dabs. The twins were busy between the wickets and they put on 45 runs in a little over 6 overs to put the innings back on track. Eventually CECC finished with 161 and Karthik was the standout performer for Wowzers keeping the CECC middle-order in check with his nagging accuracy. 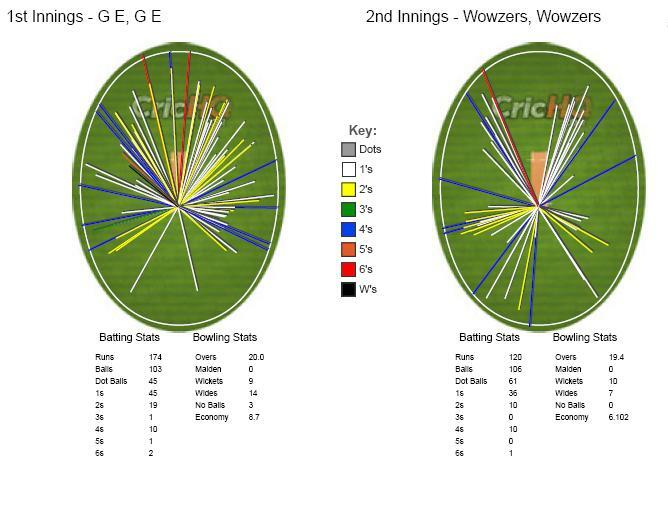 CECC’s opening pair of Goutham and Gaurav kept Wowzer’s in check with their discipline and lines. Wowzers’s openers looked to shuffle to offside while looking to make runs on the leg side. Both openers perished in this pursuit. Captain Ravi walked in and played a watchful hand so as to prevent further damage. 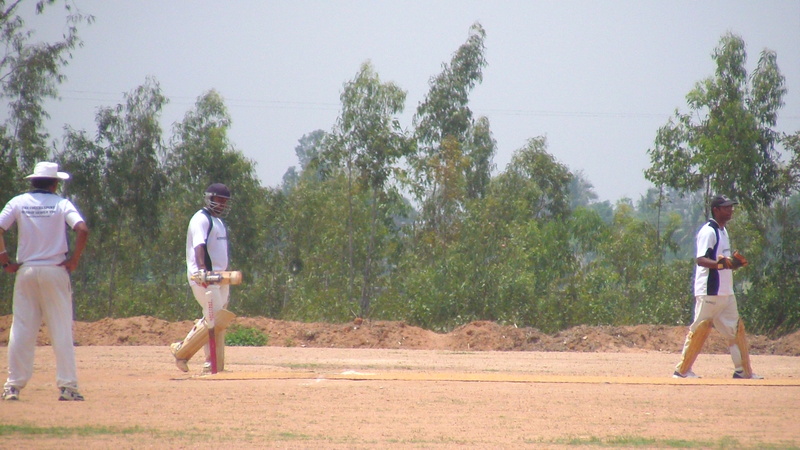 Bhargav, though, had Suresh caught pulling in his first over. The bowling hero for Wowzers, Karthik, came in and started out aggressively looking to play powerful strokes and looked the only Wowzers batsman looking to take the fight to the CECC camp. The introduction of Dinesh changed all that. He rattled the Wowzers’s middle-order with his pace and soon sliced through the middle-over in a 3 over spell that fetched him 4 wickets. With Shoukath backing his thrilling batting cameo with 2 wickets with the ball, the innings hastened to an end in the 18th over giving CECC a comfortable 75-run win.